Back in MC 1.2.5 DJ_Persnikity and I released Slappy McCracken's Ocean Life Expanded, a mod that had a pretty ambitious scope. 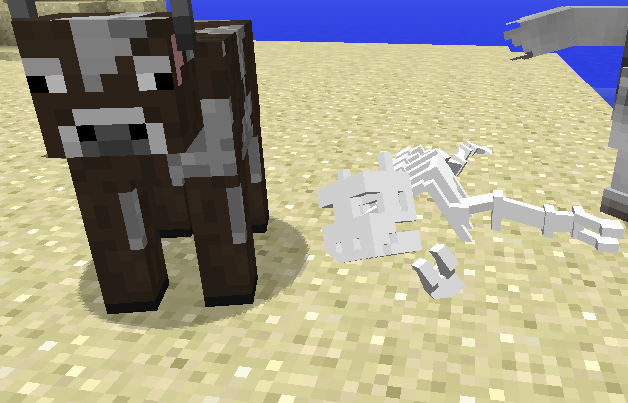 Sometime during the development process MC upgraded to 1.3.2, and the mod has pretty much been stuck in limbo since. With the recent emergence of several fish-type mods, DJ and I decided it's time to throw in the towel, since we hadn't really done anything that didn't immediately get rolled back due to computer weirdness. So, that's the bad news. The good news is that DJ and I have decided to release all of the stuff for Slappy's, techne models, textures, promotional material, clip art, and of course, the source code. The source code is probably 99% useless (I know it's a poorly structured and lacks comments) by now, but you're more than welcome to take a peek, implement it in your mod, use our models, use our textures, have at it. Some of you have asked directly if you can update the mod. Here's your chance. Do something cool with it. There are two conditions, however, and they are as follows: Any mods using our stuff should release the modified source code for others to study and learn from. Also credit us for the original work. That's it. Coming sometime, kind-sorta-probably: Slappy McCracken's World of Wonder (current dev version is 1.7.2)! I'll keep this page bookmarked in-case I ever use the source-code for something. And of course, I'll give you, and your partner credit. Not that anyone cares, mind. ANOTHER MOD !? Wow ! study and learn from. Also credit us for the original work. That's it." -Done and done. I'm pleased to amounced that some of these models will find their way into Project:Nature.